"How do I wash curly lace front wigs?" Quite a few people ask us about how to wash curly lace front wigs and we've put together a guide of the basic steps and links to other articles that go into more detail about how to wash synthetic and human hair curly wigs. The steps below outline how to wash the hair whether you're using a shampoo, conditioner or a conditioning shampoo (and include images using a straight hair wig as the detangling and washing steps apply to all hair textures). Individual strands of hair do not become saturated (filled) with odours, styling products, oil or dust; all that happens is that dust, oil and styling products sit on the surface of the hair and become trapped (along with odours) between the strands of hair. So when we wash our hair (whether wigs, extensions or growth hair) what we are primarily doing is removing the dust, oil or styling products from the surface of the hair strands and from between the hair strands. It sounds obvious, but if you keep that in mind, it'll help with you to keep to a gentle and simple hair washing routine. Detangle while the hair is dry using your fingers. Always start at the ends of the hair and work your way towards the roots (lace wig cap). Human hair is weakest when wet, so detangling when dry means you're less likely to strain the strands of hair and ruin the curly texture - if you over stretch the hair, the curly texture won't return. While the hair is still dry, use a wide tooth comb and start combing at the ends of the hair, working towards the lace wig cap. Gently tease out any knots or tangling without tugging or pulling at the hair. 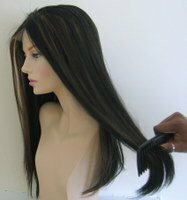 Place the curly lace front wig (or other type of curly hair wig) on a wig stand or polystyrene (Styrofoam) head if you have one. If you don't have one, then place your hand inside the wig and let the wig hang. Mix your shampoo with some warm water in a spray bottle and spray the hair until it's saturated. If you don't have a spray bottle then (get one!) then use an empty water bottle (filled with no more than 500ml) as you don't want the curly lace wig to be dripping heavily at this point. Using a wide tooth comb, start combing from the ends of the hair and move towards the top (wig cap) in order to distribute the shampoo and water. The idea is that you don't rub or massage the hair as this can cause it to tangle (yes, all the shampoo ads love to show women rubbing their hair against they're heads, but in reality all that does is create a whole lot of tangled hair). Rinse the hair by pouring lukewarm water over the hair (using the shower, tap or bottle). 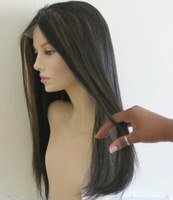 Take hold of all of the hair and gently squeeze starting at the top (near the wig cap) and working your way down to the ends. If you have a shower you can keep opening and closing your hand (squeezing) your hair at the same time as the water is running, but do not rub the hair. After the final rinse, whilst the hair is still dripping, use a wide tooth comb and comb the hair starting at the ends and working up to the top (wig cap). This does two things: it removes any tangles and the will ensure that each of the small sections of hair that make up the individual locks of curls can reform. If you use hair serum or hair oil, apply it at this stage as this will seal the moisture into the hair (in the same way that baby oil is applied to wet skin) and use your wide tooth comb to distribute the serum or oil; why not check out our guide to the best oils for curly lace wigs. Curly hair wigs (whether curly lace front wigs, curly full lace wigs or other types of curly wigs) should always dry in an upright position where the hair can hang. This is essential for retaining the curls as it allows the hair to dry in a way that lets the curls reform and set. This is so important, we'll say it again: always dry curly hair wigs by letting them hang, whether on a stand or hanging from the shower head, and never let them dry flat, otherwise the curls will be distorted. When the hair is damp, you can lightly mist it with spray moisturizer or a glycerine and water mix but don't comb the hair; why not check out our guide to the best types of moisturizer for curly lace wigs. 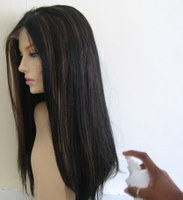 Leave the curly lace front wig to air dry. When you've done this a few times, you'll be a CWWE (curly wig washing expert). There's more to caring for your curly lace front wigs than just washing. If it's a human hair curly wig, then it will require deep conditioning, as well as moisturizing (as part of a styling regime) which will help you maintain the lovely curly texture and prolong the life of the wig.